"Get All The Support And Guidance You Need To Be A Success At Being Grateful!" 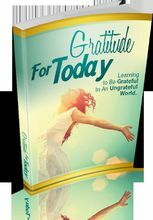 This Book Is One Of The Most Valuable Resources In The World When It Comes To Learning to Be Grateful In An Ungrateful World! Keep reading to get the help you need… Is the fact that you would like to learn to be grateful but just don't know how making your life difficult... maybe even miserable? Does it seem like you’ve tried everything in your power to figure it out, and yet, despite your best intentions, you’re still plagued with: • Not knowing how to even get started • Not understanding how gratitude fits with abundance • Not knowing how to decide what to be grateful for If this describes you, then you are in luck today... First, you are NOT alone! It may seem like it sometimes, but not knowing how to get started with gratitude is far more common than you’d think. I ought to know, because I’ve been in the same spot before... "Why Understanding All The Ins And Outs Of This Is Crucial!" This is one area you must pay attention to… Developing an attitude of heartfelt and sincere Gratitude for all your current blessings unleashes the ultimate power for obtaining many more. Give thanks each day and you will see how being grateful for everything you have today can create great changes in your life. Let me explain... “Thank you” – these two simple words can change one’s life. With the problems that we may face every day in our lives, these two little words are often the most neglected words each day. We always see the worst in life that is why we never become truly happy. Expressing your gratitude or even being thankful about the things you have is really important. This will change your entire life - the way you see life, the way you handle your problems and the way you cope with the daily challenges. And the worst part? The more you don't know the less you will succeed! Make no mistake about it... "The Costs of NOT Getting All The Info You Need Are Just Too High!" Your lack of knowledge in this area may not be your fault, but that doesn’t mean that you shouldn’t -- or can’t -- do anything to find out everything you need to know to finally be a success! The costs of continuing to repeat this pattern are just too steep... I mean, think about all of the money you’re wasting because of how continuing to try things that don't work costs you money... the time you’re losing due to going around in circles is also time-consuming... ... and that’s not to mention the toll it’s taking on your personal life, like the way the failed attempts over and over can impact personal life/relationships. So today -- in the next FEW MINUTES, in fact -- we’re going to help you GET ON TRACK, and learn how you can quickly and easily get your gratitude under control... for GOOD! That is why I've written this book... "This Book Below Will Show You Exactly What What You Need To Do To Finally Be A Success!" As a person just like you who has struggled with gratitude, I have searched high and low to find the best strategies to fix this problem and I am fully qualified and equipped to help you put an end to your frustration with trying to wade through all the info you need to know to be grateful! Gratitude means counting your blessings, thankfulness, acknowledging things that you receive and noticing those simple pleasures in your life. The moment you wake up in the morning, say a little prayer, giving thanks to another life given to you. Gratitude means learning to live a kind of life as if things were miracles, and it also means being fully aware on continuous bases about how much you have been given. And all of this up till now is just the beginning! Are you ready? 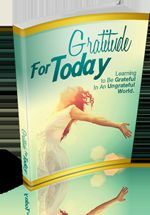 "Introducing… Gratitude for Today!" 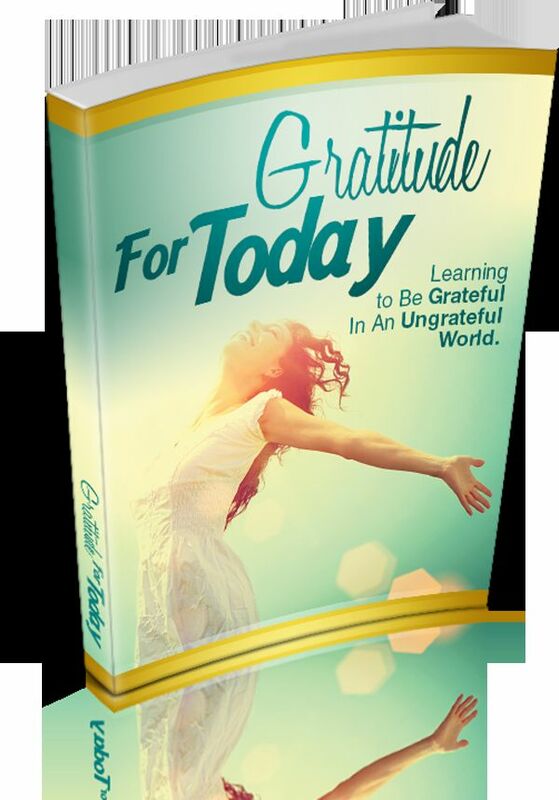 This powerful tool will provide you with everything you need to know to be a success and achieve your goal of being grateful to a successful place. With this product, and it’s great information on gratitude it will walk you, step by step, through the exact process we developed to help people get all the info they need to be a success. Who Can Use This Book? - Entrepreneurs - Internet marketers - Network marketers - Life Coaches - Personal Development Enthusiasts - Self Improvement Bloggers - Web Publishers - Writers and Content Creators - And Many More! 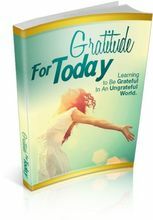 In This Book, You Will Learn: Gratitude Basics How Gratitude Fits In With Abundance Deciding What To Be Grateful For How Gratitude Works With Abundance Getting In The Right Mindset And so much more! "Get All The Support And Guidance You Need To Be A Success At Being Grateful!" This Book Is One Of The Most Valuable Resources In The World When It Comes To Learning to Be Grateful In An Ungrateful World! Is the fact that you would like to learn to be grateful but just don't know how making your life difficult... maybe even miserable? First, you are NOT alone! It may seem like it sometimes, but not knowing how to get started with gratitude is far more common than you’d think. Developing an attitude of heartfelt and sincere Gratitude for all your current blessings unleashes the ultimate power for obtaining many more. Give thanks each day and you will see how being grateful for everything you have today can create great changes in your life. Expressing your gratitude or even being thankful about the things you have is really important. This will change your entire life - the way you see life, the way you handle your problems and the way you cope with the daily challenges. So today -- in the next FEW MINUTES, in fact -- we’re going to help you GET ON TRACK, and learn how you can quickly and easily get your gratitude under control... for GOOD! 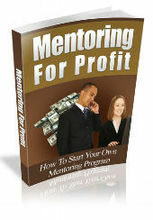 "This Book Below Will Show You Exactly What What You Need To Do To Finally Be A Success!" As a person just like you who has struggled with gratitude, I have searched high and low to find the best strategies to fix this problem and I am fully qualified and equipped to help you put an end to your frustration with trying to wade through all the info you need to know to be grateful! Gratitude means counting your blessings, thankfulness, acknowledging things that you receive and noticing those simple pleasures in your life. The moment you wake up in the morning, say a little prayer, giving thanks to another life given to you. Gratitude means learning to live a kind of life as if things were miracles, and it also means being fully aware on continuous bases about how much you have been given. This powerful tool will provide you with everything you need to know to be a success and achieve your goal of being grateful to a successful place. With this product, and it’s great information on gratitude it will walk you, step by step, through the exact process we developed to help people get all the info they need to be a success. Tying The Knot Only Once!